I have installed a new rating plugin that gives you, my readers, a convenient and fast method to give feedback. So please do so, let me know what posts you find interesting! And… if we can read it we can also write it? You can safely try it since it of course affects the current process only, so don’t worry. I needed to obtain the Fully Qualified Domain Name (FQDN) for a given NetBios domain name. Eg from MYDOMAIN to dc=mydomain,dc=local. I did some tests with the TranslateName API and if you append a \ to the domain name it returns the FQDN. If you look into the registry in the key HKLM\System\CurrentControlSet\ProductOptions you will find several licensing related Values. As you can see the license names are there as a Unicode string and later on I will show you how we can read the values. But because I didn’t want to extract all the names manually I decided to see if I could reverse the used structure because it didn’t look very complicated. 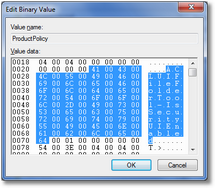 Using a Hex Editor I could determine the important part of the structure. Again a about post about using the Virtual TreeView component (did I mention it’s brilliant? ), this time I will talk about memory leaks. I often use Records to hold the treedata, and usually the record holds some string data (eg a caption) and an (a reference to) an Interface or Object(List) that holds more data. If you are familiar with Virtual Tree then you know that you must can the NodeData in the OnFreeNode event. When working with the Virtual TreeView component the most optimized way of adding (or removing child nodes is by changing the ChildCount.